This recipe is adapted from the Southern Living: Ultimate Quick & Easy Cookbook: Incredibly Good, Unbelievably Easy — over 450 Superfast Recipes . It’s a quick custard buried in fresh whipped cream and berries and you can serve it in any kind of decorative class. I’ve packed away most of my decorative glasses, so I just used a couple of water glasses and made fairly large portions. Next time, I’d go with large wine glasses or possibly small tumblers. The custard itself was pretty basic and only took a few minutes to make. I wish I’d discovered this recipe sooner because Todd enjoyed it so much and its open to so much improvisation. For instance, as I’m typing this I’m thinking how great the custard would be spooned into glass and layered Nilla Wafers, bananas and whipped cream, and served as Banana Pudding for two. I halved the original recipe (and added a little butter) and got 2 very generous servings. Southern Living’s full version is here. 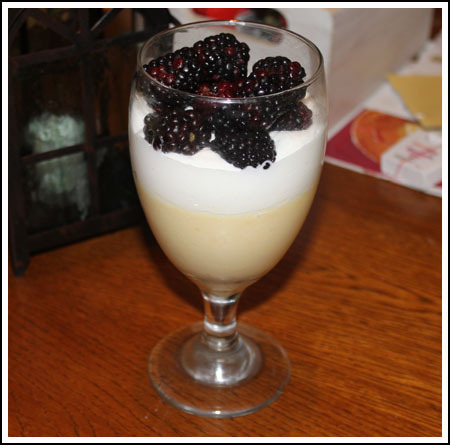 Vanilla custard recipe which is best served cold with whipped cream and some kind of fresh fruit such as blackberries. Combine first 3 ingredients in a heavy saucepan not set over heat; whisk in egg yolks and whisk in about 1/3 cup of the milk. Set over medium heat and gradually whisk in the remaining milk, whisking constantly until thickened -- original recipe said 5 to 7 minutes, but mine thickened in about 3 since it was a half batch. Remove from heat. Whisk in vanilla and butter. Divide evenly among 2 or 3 wine glasses; cool. Cover and chill 2 hours or until ready to serve. Before serving, beat whipping cream at medium speed with an electric mixer until foamy; gradually add sugar, beating until soft peaks form. Spread over custard. Top with fresh blackberries. Chill time not reflected in prep or cook time. Melissa, I love using custard recipes where the egg yolks are added first and then you slowly heat it up while whisking. In most cases (see below, ha!) it prevents lumping. Jennifer, I am glad you made it work. I’ve put down my whisk while making custard and have had the same thing happen. Glad the strainer saved the day. Next time I will add a vanilla bean. I made the custard last night and it came out really good. Lacking patience, I didn’t whisk it the whole time and it started clumping up. I just whisked it extra hard, then ran it through a mesh strainer to make sure it wasn’t lumpy. I did add a vanilla bean to the the milk while it heated and then cut it open and scraped the seeds into it. I love vanilla! That custard looks yummy! I’ve never seen a recipe where you start with the yolks in the pan. Looks really easy and fast, which is always a plus! The quick and easy idea seems to be a constant for me lately! I think it’s our crazy early heat wave here in the Northeast. I’ve even created a new tab for quick and easy recipes on my blog! I’m also one who has never liked Shoo Fly Pie but your cupcake recipe sounds good! Debbie, I think I might like it better if made with the King syrup. In fact, if I ever go to Pennsylvania I’ll make sure to try a properly made Shoofly pie. At one point, I made a bunch of them. They were pretty good, but the molasses was a little bit too strong. That custard looks wonderful. I just saw your shoo fly cupcakes and I happen to adore shoo fly pie! I will have to make these. I wonder if you would like shoo fly pie better if you used King syrup instead of molasses? King syrupe reminds me much more of the shoo fly pie I had as a child when we visited the Pennsylvania Dutch area….